The much awaited theatrical trailer of 'Andhhagadu' has been released and it is not only entertaining, but is intriguing as well. Raj Tarun, a blind youth, works as an RJ. He is least concerned about his blindness and enjoys life to the fullest. He woos girls and even falls in love with one. But here is a twist. Just when he gets to see the world, problems start and due to some 'Kulakarni', some goons start torturing him. Who is that 'Kulakarni' and why the hero wishes he remained blind would be interesting. Going by the trailer, the entertainment factor in the movie is going to be high. The trailer suggests that the film is packed with good comedy, romance, thrill and action. 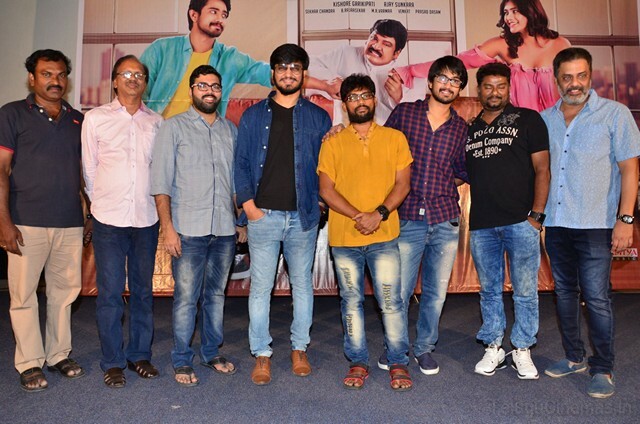 Sudharshan and Satya as Raj Tarun's friends are going to entertain. Hit pair Raj Tarun and Hebah Patel are back with this movie and looks like the love track is going to be interesting. Raja Ravindra plays a baddie in this movie and looks like he is playing a very interesting role. After 'Eedo Rakam Aado Rakam', looks like Rajendra Prasad and Raj Tarun are going to entertain together once again in this movie. Ashish Vidyarthi is also seen in the trailer. This movie, produced by AK Entertainments, is going to hit the theaters on 2nd June and it is awaited. The songs, composed by Sekhar Chandra, have got a good response and the team is planning aggressive promotions in the run-up to the release.